Since the introduction of minimally invasive surgery in the 1980s, there have been countless advances in technology culminating in the development of the field of robotic-assisted surgery. The field of urology has been at the forefront of robotic-assisted surgery dating back to 1989 when the PROBOT was used to assist with transurethral resection of the prostate.1,2 Further devices were designed for transrectal ultrasound-guided prostate biopsy and percutaneous nephrolithotomy.3,4 In the early 1990s, several companies began to develop “master–slave systems,” where the surgeon controls the robotic instrument arms remotely from a console. The purpose of these systems was to eliminate physiologic tremor and to increase surgical dexterity and precision. Subsequent refinement in these systems led to the introduction of the da Vinci® Surgical System (Intuitive Surgical, Sunnyvale, CA). Since the first robotic-assisted prostatectomy in 2000 and subsequent Federal Drug Administration approval, the da Vinci® has been used in a vast array of urologic surgeries and surgical techniques have now been described for almost every genitourinary organ.5 A proper understanding of robotic instrumentation is pivotal to the implementation of a successful robotics program. 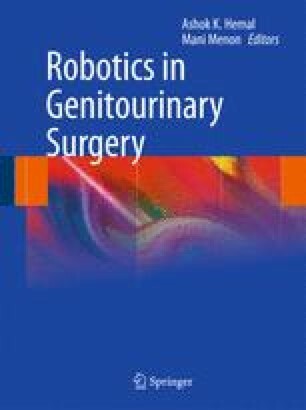 This chapter will review fundamental principles of robotic instrumentation using the da Vinci® Surgical System, surgical team, operating room setup, and basic principles of robotic-assisted surgery.